Free for children 18 and under. Members $15 Buy online under tab Raaga Sales. A student of the Kirans of Bangalore, Sushmitha started her career in dance at the tender age of 4 under the tutelage of eminent Gurus Sri. Kiran Subramanyam and Smt. Sandhya Kiran and has successfully flourished as a beautiful and technically sound dancer. She has in the years, evolved to become an artiste who induces her work with critical thought. Being a senior performer of the Rasika Arts Ensemble, Sushmitha has performed extensively at several prestigious festivals all over the country. 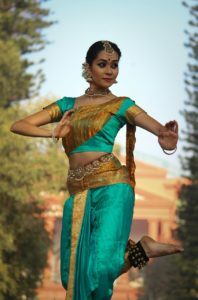 Having completed her Arrangetram in 2010, her love for Bharatanatyam took to her to several heights, allowing her to perform at prestigious festivals. She has had the opportunity to perform at the Ananya Dance Festival – Purana Qila in Delhi, Narada Gana Sabha – Chennai, Udupi Utsava, Mangalore, Shilparamam, Kittappa Pillai Memorial Yuva Nrityotsava, Articulate festival, Sai Nrityotsav, Moodabidri, Kinkini Nrithyotsava, ICCR, Purandarotsava, Nirantharam,Sammilana, Samarpana, Arpana, Nrityaarpana, Nritya Sankeertanam, Rasikaarpana, Bhava Sankramana, Sharanagati and several others in Bangalore. Being a part of the latest productions, ‘Maanini’ and ‘Saravana Bhava’ have been some of the greatest feathers in her hat. She has represented her educational institutions – M.E.S. Kishora Kendra, Mount Carmel College and Jain University as the cultural head and won several inter and intra institutional competitions at state and national levels and come out with flying colors. free lancer and has worked with several artists and dance groups like the Aayana Dance Company, Nritarutya in the ‘Make in India production’ and Raadha Kalpa, being one of the dancers of ‘The Dark Lord’ choreographed by Rukmini Vijayakumar, ‘Shastram’ a unique production combining Film, Theatre and Indian classical dance by Ghirija Jeyaraj staged at Perth, Australia. Besides performing, Sushmitha recently founded Vivartana – the art studio, where she aims at imparting her knowledge of Bharatanatyam to the masses and taking our traditional arts forward to the generations to come. Sushmitha is also representing Raaga at FGCU at the International Reception on Friday Sept 14th, 5:30-7:30 pm and conducting a workshop for Raaga dance students on Saturday Sept 15th.